Local blog 'The Riot Act' has a series of 'debates' called 'Face Offs' in which an advocate and an opponent of idea de jeure are pitted against each other, and given 500 words to convince you the public of the merits of their cause. ACT Light Rail were recently asked to take part in a 'Light Rail v Bullet Train Face Off'. We had reservations, as aside from rails, the two technologies are very different and serve very different needs. Nevertheless, we decided to take part. The topic: Given the current financial climate, are our municipal funds better spent on light rail or a bullet train? Here is our contribution below, as posted on their site. Click on the link, and go to the Riot Act site to take part in their debate. Comparing the two is the classic apples to oranges cliché, as they are very different transport solutions with little in common aside from rails. However, that is what Riot Act has requested. For the short and long term benefit of the ACT ratepayer, it is better to build Capital Metro from Gungahlin to Civic, and eventually across Canberra, than a bullet train. Planning and engineering studies for light rail are well underway. Construction costs can be estimated, as building light rail is a standard and routine engineering task in Australia. Aside from conceptual feasibility studies, no similar work has been performed for bullet trains. If it was ever built, it may never come here, instead running directly between Melbourne and Sydney. Investing in light rail is not the challenge many believe. The ACT will receive 4.4 billion dollars this year from the Federal government, an amount rising incrementally every year. In this context a public transport investment of 600 million over 4 years is fiscally prudent and a sound long-term investment in a growing city. Light rail has strong electoral support, with the parties taking it to the 2012 Assembly election forming government. Individuals campaigning for bullet trains attracted a handful of votes, as bullet trains provide few clear benefits. 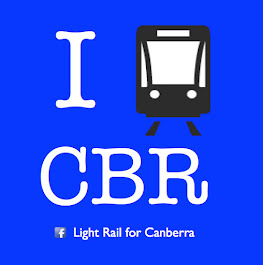 Regular polling conducted since consistently shows a majority of Canberrans supporting light rail. Canberrans understand the short and long term benefits. The use of public money for any project requires careful consideration using triple bottom line analysis – economic, environmental and societal. In each area Capital Metro delivers immediate and long-term benefits to Canberra, that bullet trains can’t match. Light rail will provide direct economic benefit in the ACT enhancing productivity, freeing families from needing a second car and allowing parking space to be better used. Increased patronage and retasked ACTION buses will lead to a decrease in the public transport subsidy. Many construction jobs will be immediately created. Transit oriented development will act as an economic growth driver. Businesses will establish themselves along the corridor knowing that parking wont be required for all staff, and that clients can visit them with ease. Light rail will alleviate road congestion, mitigate future road construction costs and lead to a reversal in falling public transport patronage by attracting new passengers. Tourists visiting the nations capital will no longer get lost on the wrong bus. Increased density along the corridor will lead to more walking, and a rise in the number of small businesses to service the needs of new residents. As Capital Metro expands across Canberra, this will be repeated. The longer term benefits of light rail will be seen as its influence in shaping Canberras growth and culture emerge over several decades. Those preferring a suburban house and backyard will still have that option, but people seeking an apartment style of living will have that option in more quantity, and at lower cost. Bullet trains may be wonderful technology and one day in the future deserving of finance, however the immediate priority for Canberra’s ratepayers is not visiting Sydney in 30 minutes, but commuting to work in 30 minutes.